Enjoy 2 nights Bed & Breakfast & a 2 course meal each evening in our award-winning Bay Brasserie with spectacular views of the Clare hills. 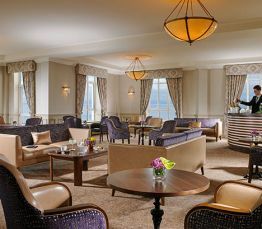 Embrace all that the west has to offer with a stroll along Salthill's famous Promenade or sit back and watch the sun go down over the majestic Atlantic Ocean from our Seascape Lounge. Avail of exclusive discounts off many activities such as a discounts day trips and Guided walking tours or discounts off beauty treatments. All from only €135 per person sharing. Enjoy a host of FREE activities at the hotel all year long... book your Golden Years break now and look forward to a genuinely warm welcome. Offer available on selected midweek dates in April. No single supplement on January & February dates. Check in & Check out time: Our check in time is from 16.00 onwards, access to rooms for early arrivals is strictly subject to availability. Check out time is 12 noon. To make a booking you must enter the details of a valid credit or charge card legally held by you. Cancellations: If cancelled or modified up to 2 days before the date of arrival, no fee will be charged. If cancelled of modified later or in the event of a no-show, 100 percent of the first night will be charged. During Summer (July 1st to August 31st), if cancelled or modified up to 7 days before the date of arrival, no fee will be charged. If cancelled of modified later or in the event of a no-show, 100 percent of the first night will be charged. Deposits: With the exception of Christmas & New Year & Galway Race Festival Week (see Special Terms & Conditions), no deposit will be charged and the cost of the accommodation in full is required on check in the case of a debit card. A pre authorisation is required in the case of a debit card. Any additional costs incurred during the stay shall be paid prior to departure. Pre-authorisation: To check the validity of your credit card and guarantee your booking, the property reserves the right to temporarily hold an amount of €1 prior to arrival. Special Terms & Conditions: For all Christmas and New Year bookings (which include December 25th and/or 31st) & Galway Race Festival Week, a non refundable deposit of €100 will be charged to credit/debit card at time of booking. Cancellation and prepayment policies may vary according to season/date. Please review the offer details for special conditions that may apply. All other terms and conditions remain as outlined above.